Does the evening news make you question what happened to your America? Can this possibly be the nation that spent more than two centuries crafting itself into the strongest, most envied and productive country on Earth? 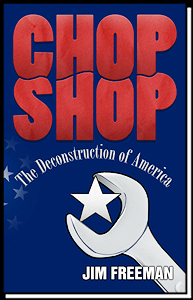 Chop Shop is a refreshingly ironic and down-to-earth analysis that makes clear the origins and responsibility for an unprecedented Deconstruction of America. The past four of our forty-four presidents treated this country like a stolen car, selling it off in parts, plunging the nation toward mediocrity and the loss of personal freedom. The past two administrations increased that momentum and Freeman sees us with our backs against the wall. He argues that we either restore our constitutional legacy, both physically and intellectually, or lose the necessary energy to rebuild our dynamic republic. Without being a rant against liberals or conservatives, Chop Shop flags the many stops along a route that dumped us at this point, confused and at each others' throats. We all share equally in the blame for that deconstruction. The book demands we look at America as it is, without the comfort or distraction of finger pointing. First steps forward require an understanding of what went before. Chop Shop uses that structural history, from its 19th century origins, to understand this threat to American society. We thus far have failed to do that and are losing it all in ignorance. The time is short. The impact is enormous and undeniable. Freeman states the case with enough humor and sense of irony to make the read, if not a pleasant journey, certainly an informative one.